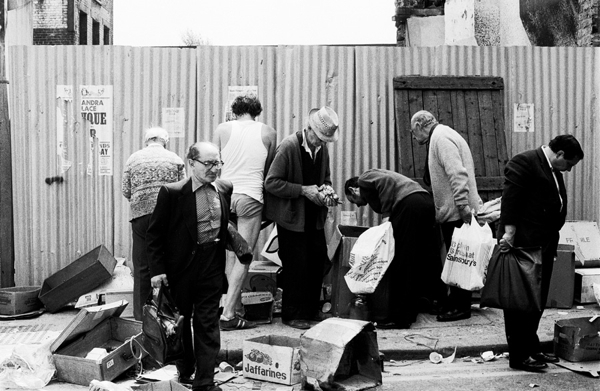 Let us take a walk through Cheshire St, Brick Lane, Sclater St and Club Row in the company of photographer Colin O’Brien to experience the life of the Sunday market in the nineteen eighties. 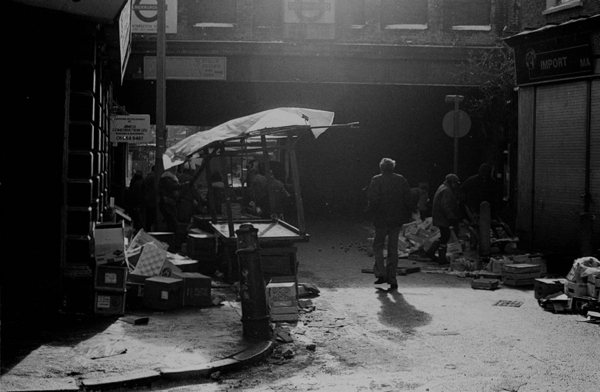 “I loved markets as a child, because I grew up during the nineteen forties in Clerkenwell and I used to go to Leather Lane to hear the patter of the stallholders. There is this mystique about markets for me. 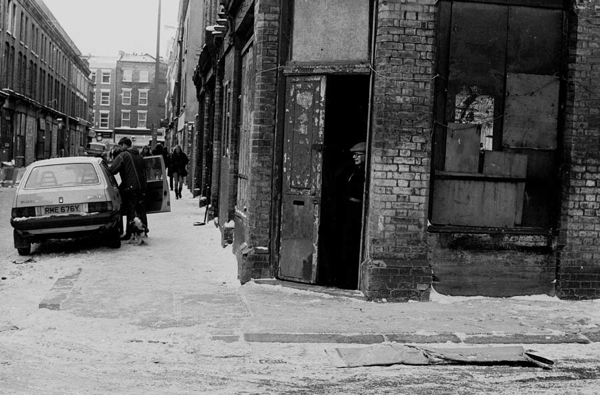 I love being surrounded by people and I feel safe in a crowd.” Colin told me, his grey eyes shining in excitement, as we made our way through the crowd onto the bare ground between Cheshire St and Grimsby St where traders sold their wares upon the frozen earth, by the light of lamps and candles. 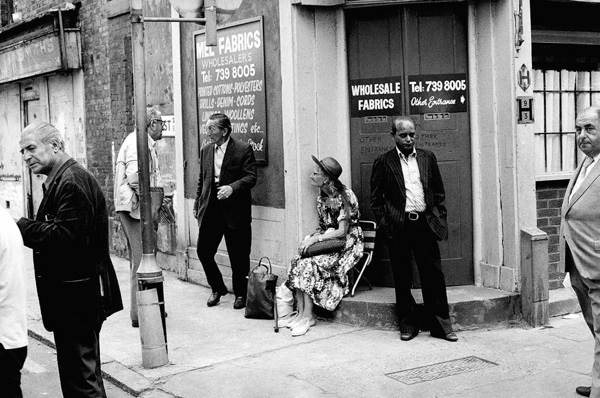 I noticed that the woman sitting at the centre of Colin’s photograph “Coming & goings at the corner of Brick Lane” was surrounded by five men and yet not one was looking at her. 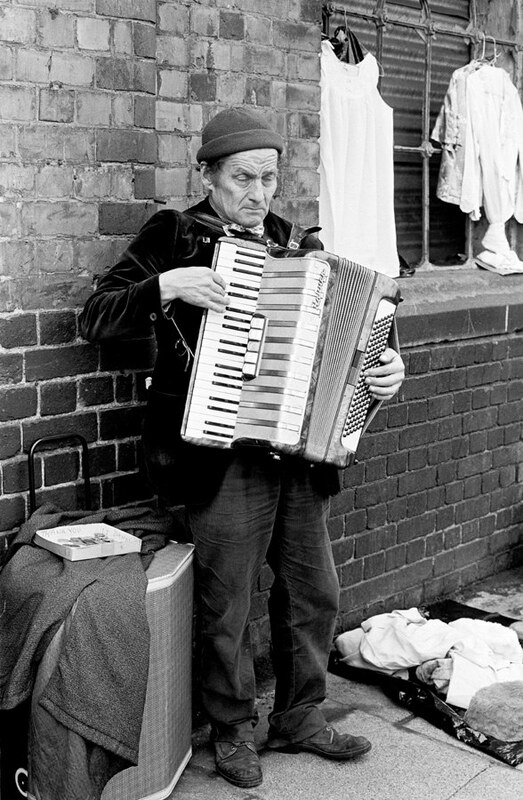 I realised that he had photographed her invisibility, and that the same was true for his other soulful portraits of market-goers, market-traders, homeless people, old people and marginal characters – all portrayed here with human sympathy through the lens of Colin O’Brien, yet gone now for ever. 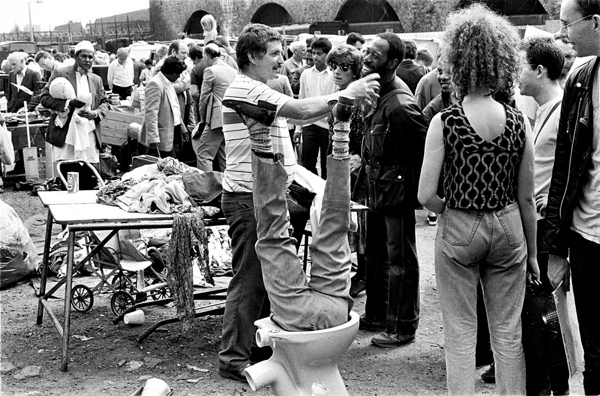 Comings and goings at the corner of Brick Lane. 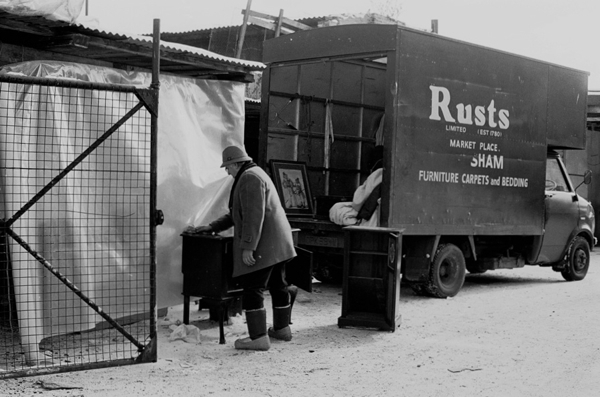 At the time of the miners’ strike. 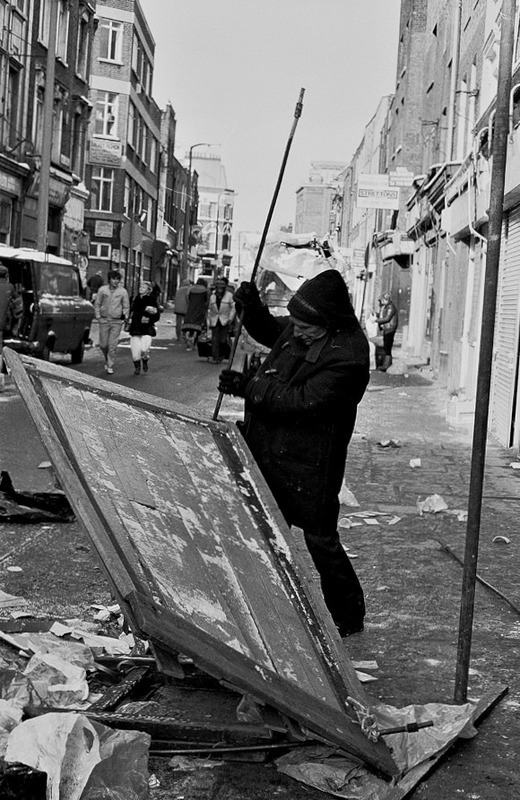 Taking down the stalls on Brick Lane. 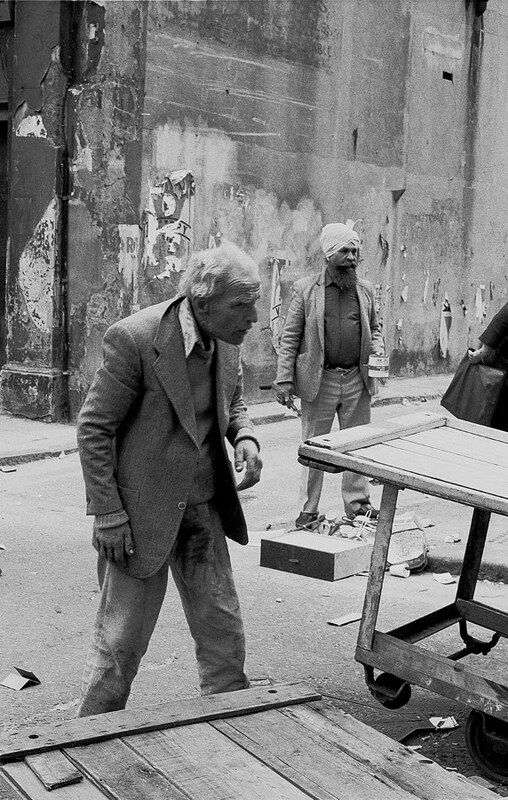 Clothes and perms aside, these could have been images from much earlier than the 1980s. 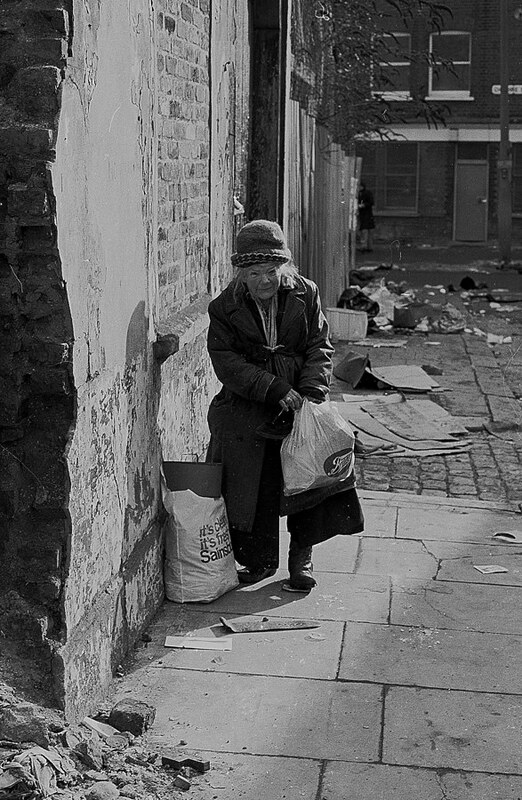 I can remember being driven into London through the East End (from Essex) in the 1970s and still seeing pockets of post-war bomb damage, which was quite shocking for a child living in a modern house in middle class comfort. Thanks for these moving images. Black and white says so much more than colour. 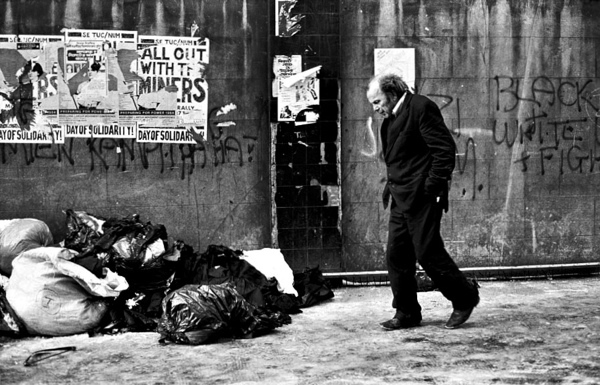 Incredible and very moving pictures – I lived near there for some years, but was always more familiar the 19th century than with recent history. These are wonderful and insightful. The second to last photo is very moving, such a hopeless scene. Thanks for these pictures. I moved into the area just as it started to get gentrified but I’d never seen it in such light before. 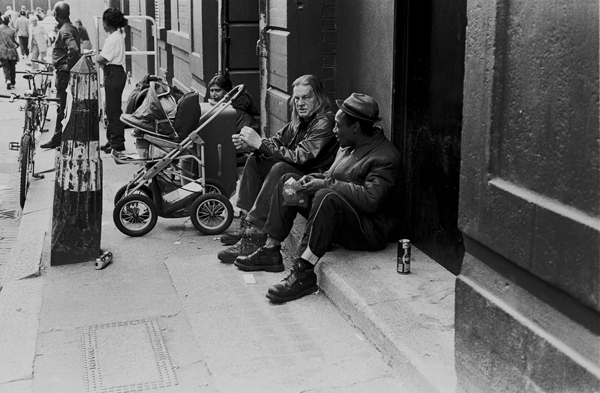 These photos bring the song ” Streets of London” by Ralph McTell to mind and remind me of the nights when I used to help with a soup kitchen that stopped on the corner of Brick lane. 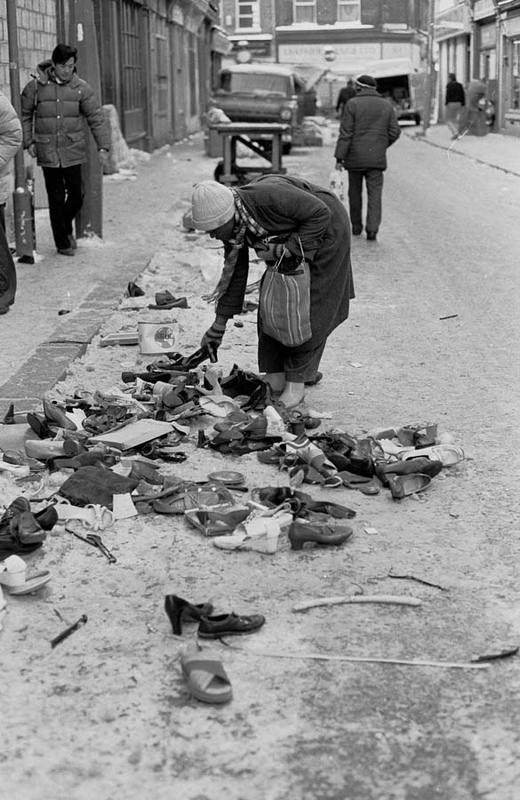 We met many people who were homeless and seemed to have lost hope but there was an old lady, with her bags of clothes, who used to come by to chat. She did not always take any food from us but loved to chat with us. 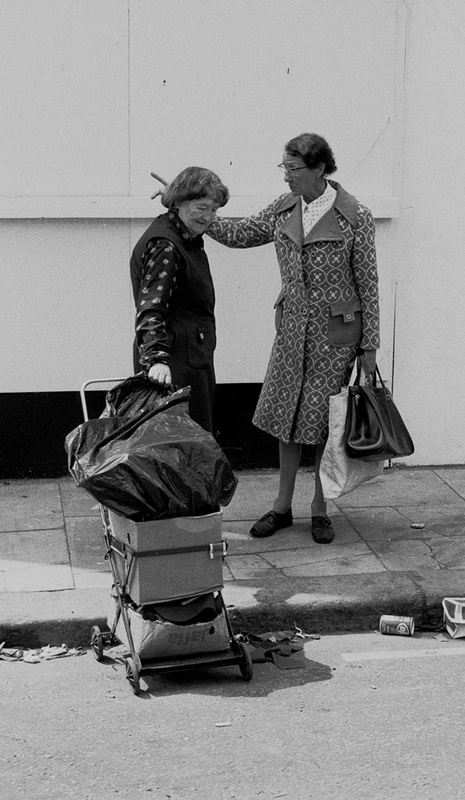 She was called Ethel and was one of a few that made you realise that giving up is not an option. 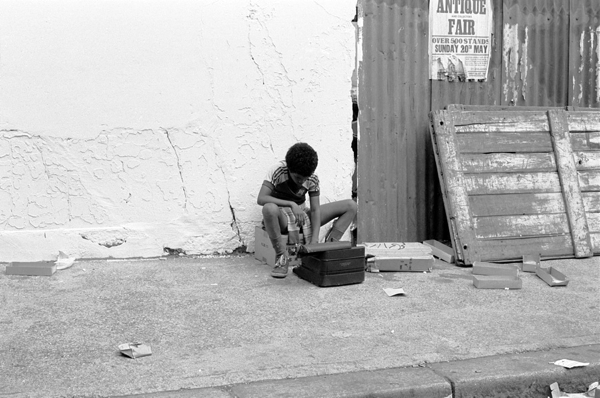 Wonderful photos that bring back strong memories. Thanks for these wonderful photos. 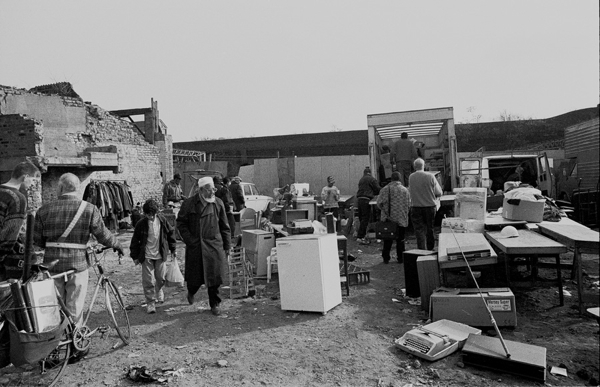 I’ve lived in the area for the past 15 years and they vividly capture what’s been lost in the recent “regeneration” of the area. 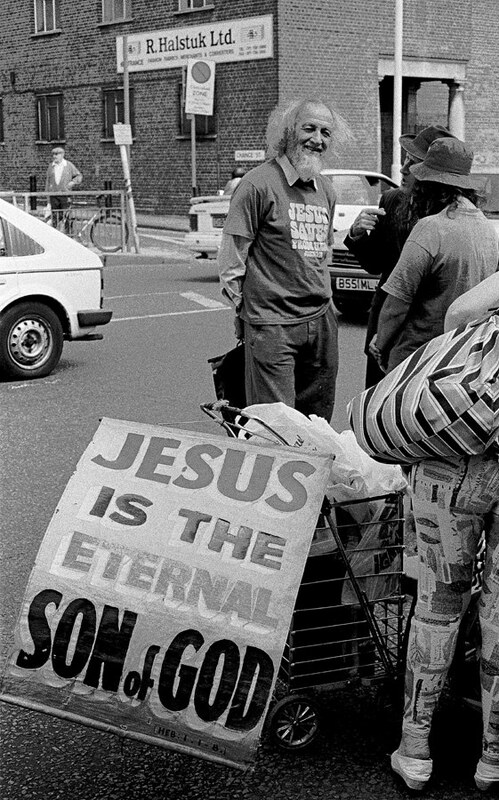 One very minor point: the first set of photos seems to be from the 1990s rather than the 1980s – note the presence of an 0956 mobile phone number! Great for sharing these wonderful pictures. 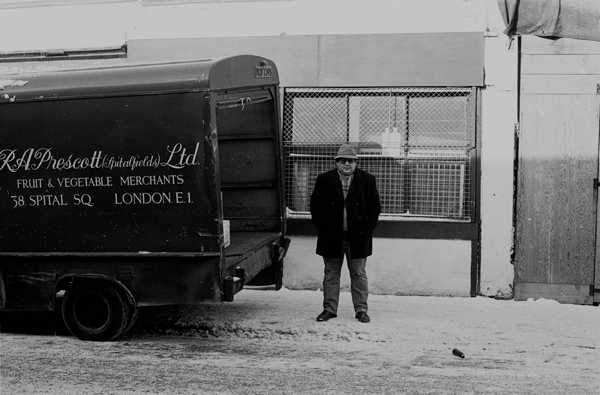 I worked as a market trader through the whole of the Eighties on Sclater St and also Cheshire St with my late Dad (during my school years). 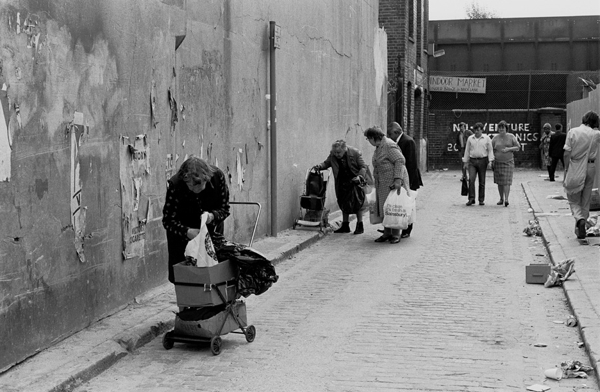 I often look for photos of the area during that time and these are exactly how i remember. Few words can describe that time and place but your photos do the job very well. I can just say a big WOW!!! AMAZING takes me back to the olden days! Compared to my sophisticated life in my luxury palace, a BIG difference, what a life! 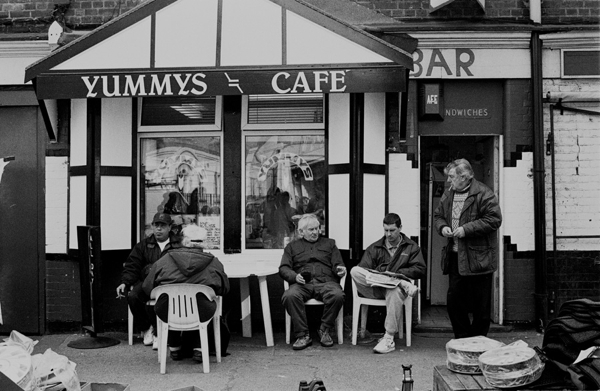 Colin – these pictures are extraordinary. 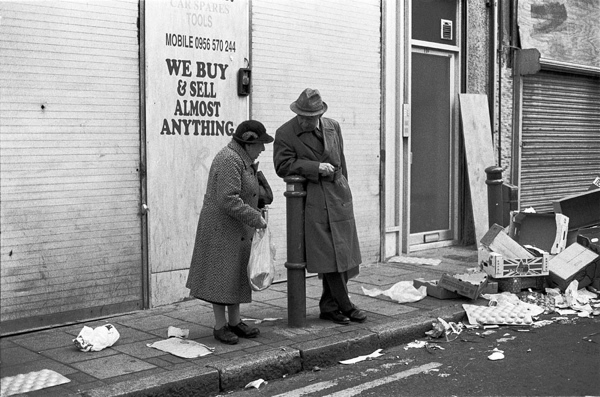 I had a shop on Cheshire St for a couple of years (the robot shop) and watched with dismay as the old and unfortunate were displaced by the feckless scions of the middle classes. 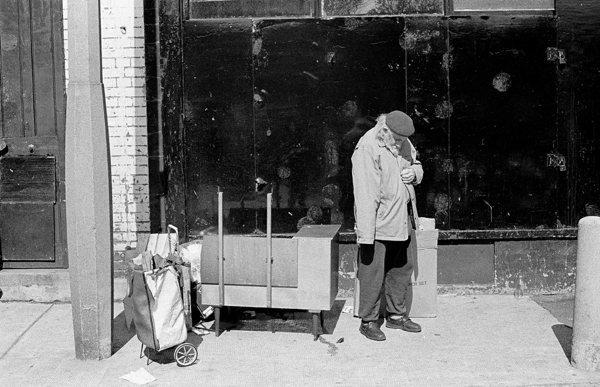 Blackman’s shoes is the only honest shop left, and the old man died recently. 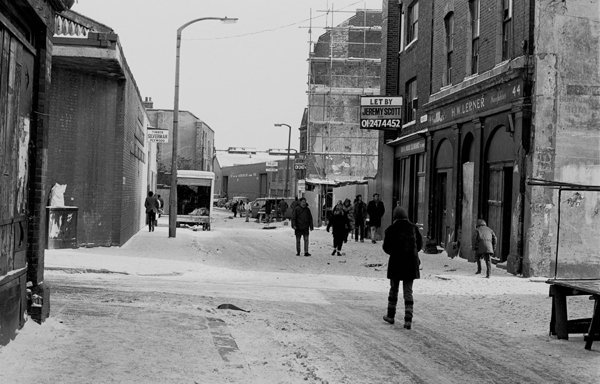 I feel very sad when I look at these picture’s, I see so many face’s hear that are no longer with us, people that I remember even as a boy, To this day, I have worked on Sclater st every Sunday for over 42 year’s, (I’v only missed a few week’s in 1976 when I broke my leg ! ! ) 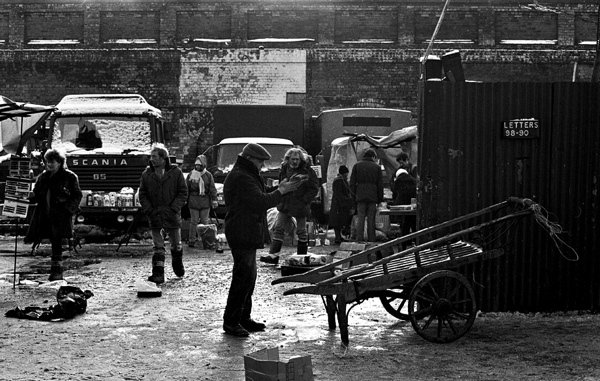 I love this market, My whole life has revolved around it, But it is changing so much now, and so fast, I fear for it’s future, So few of the old face’s are left, And most of the new generation of people who frequent the area now have no real interest in engaging with the tradition’s of this historic East London street market, I have an uneasy feeling that the diminishing band of stalwart’s like myself who are fighting a desperate bid to preserve this famous East End tradition, are doing so in vain, For in reality, I think we are now fighting a cause that is already lost, in all but name. 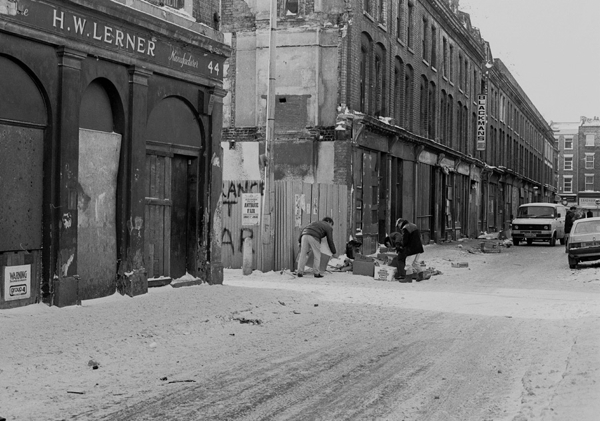 I was born and grew up in Bethnal green ,a great place to be a kid in the 1960-1970s all those dumps debris and bombed houses ,and brick lane on a Sunday was out of this world …..great days great memory’s ….